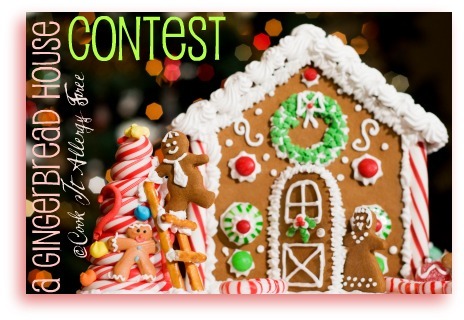 Gingerbread House Contest Over-Winner Is Announced! The first ever Cook It Allergy Free Gingerbread House contest has ended. The Houses have been matched with their Makers (or rather, Bakers). The secret is out about who made what. And with over 700 votes, we have been busy making sure all votes are legitimate and accounted for. So, with no further ado…the winner of the iPod Touch and the free download of my Cook It Allergy Free iPhone and iPad App is…… #9 KATE HOLMES! Congratulations to Kate and her family for their absolutely wonderful creation! And thank you so much to ALL of you who contributed your beautiful houses to the contest and for making this contest such a hit! I had so much fun watching all of the votes roll in, even if it kept me awfully busy moderating them all. Next time, I will be using a poll widget for sure, to facilitate in this process. Oo. Loved seeing who made what!!! Congratulations, Kate! You did a beautiful job! Congratulations Kate, you deserve it! Congrats to Kate! It was beautiful. Great job! And thank you, Kim, for hosting. You sure know how to make me crazy, I mean make me have fun. 😉 I admire you, my friend, for all that you went through and still came out smiling on the other end. The merriest of Christmas’ for you and yours, for sure. Now, take a break and enjoy everything around you. You deserve to relax and enjoy.